David Bowman, Europe’s largest pumpkin grower, was appointed as the world famous park’s official pumpkin supplier earlier this year. He has spent weeks growing the perfectly-shaped Halloween treats – with the unmistakable Mickey Mouse ears replicated in pumpkin form. The produce is currently on display at Disneyland Paris as guests from all over the world flock to their Halloween Festival this weekend. Mr Bowman, from Spalding, Lincolnshire, said: “I have grown many varieties in my time but this is a pumpkin first for me. “We’ve had a few challenges because of the bad summer this year but we’ve grown a good Mickey crop. They’ve turned out well but because they are such an unusual shape, people think they’re fake! 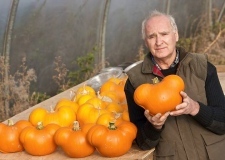 Mr Bowman has worked in the pumpkin business for 40 years but this is the first time he has grown a custom-shaped crop. He grows more than three million pumpkins every year, using almost 500 acres of land. 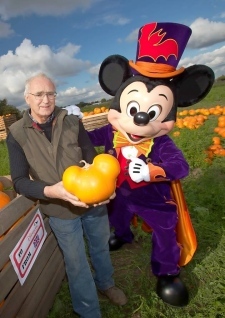 The distinctive Mickey Mouse silhouette was achieved using a specially-designed mould which was fitted to the pumpkins in the early stages of growth. The pumpkins grew until they filled the moulds and were then left to ripen. And to complete the fairy tale, the pumpkins were grown using a special seed variety… known as Cinderella.